Amsonia hubrichtii is a native perennial plant that is commonly called blue star. This blue flowering perennial is a beautiful foliage addition to any garden setting, especially butterfly gardens. 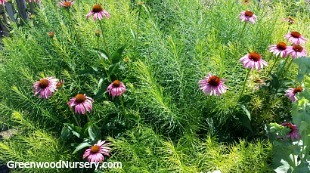 Plant among coneflowers, yarrow, butterfly weeds and other brightly flowering perennial plants to make those plants pop even more. Amsonia hubrichtii grows in the 2 to 3 foot tall range and can spread as wide. This upright growing plant has feathery foliage that emerges green in spring throughout summer, then changing to brilliant gold shades for fall foliage. Pair Blue Star or Amsonia Hubrichtii with coneflowers for an amazing setting. Our favorite is the multi-colored Cheyenne Spirit Coneflower. Orders shipping to CA and AZ addresses will be bare rooted before being prepped for shipping.